We’d love your help. Let us know what’s wrong with this preview of Love at Fourteen, Vol. 7 by Fuka Mizutani. As Class 2-B makes landfall in Kyoto, everyone's talking about who's going to confess to whom. Amidst the mayhem, Kanata is shocked to realize that despite their developing romance, Kazuki's never actually told her how he feels about her! There's love in the air, but for Kanata and Kazuki, will this momentous confession--if it ever comes--just be too little, too late? To ask other readers questions about Love at Fourteen, Vol. 7, please sign up. As always, this manga is very sweet when it focuses on the main couple, and a little discomfiting when it dwells on the will-they-won't-they relationship between the fourteen-year-old student and his adult female teacher. The main stories this volume focus on the students investigating supernatural urban legends about their school for a school newspaper article and trying to figure out which high schools they will be attending in a year or so. 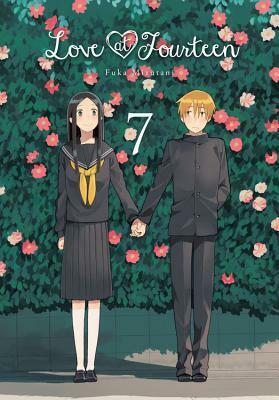 Gentle humor, slice-of-life scenes, and mild drama ab As always, this manga is very sweet when it focuses on the main couple, and a little discomfiting when it dwells on the will-they-won't-they relationship between the fourteen-year-old student and his adult female teacher. The main stories this volume focus on the students investigating supernatural urban legends about their school for a school newspaper article and trying to figure out which high schools they will be attending in a year or so. Gentle humor, slice-of-life scenes, and mild drama abound. As I've said in previous volumes, I'm really concerned about the relationships between the students and teachers. Specifically, the relationship between Hinohara-sensei and Nagai. Kids can have as many crushes on their teachers as they want. The problem is when teachers have crushes on their students. The chapters about the school wonders were great, though. More of that, less of the drama please! This is the seventh book of the series. The earlier books were often charming. This book has some good moments, but I think it has just about worn out its theme.